Orlando Arcia singled home the game-winning hit in the bottom of the 15th inning to give the Milwaukee Brewers a 7-6 win over the Pittsburgh Pirates. Baseball is always better in a pennant race. Yesterday, the Chicago Cubs (74-53, .583) needed a home run by rookie David Bote to beat the Cincinnati Reds (56-73, .434) in 10 innings and extend their winning streak to three games. After grabbing an early 7-0 lead, the St. Louis Cardinals (72-57, .558) survived a five-run rally by the Colorado Rockies (70-58, .547) in the bottom of the fifth inning. The Cardinals extended their winning streak to four games and have won eight of their last 10. 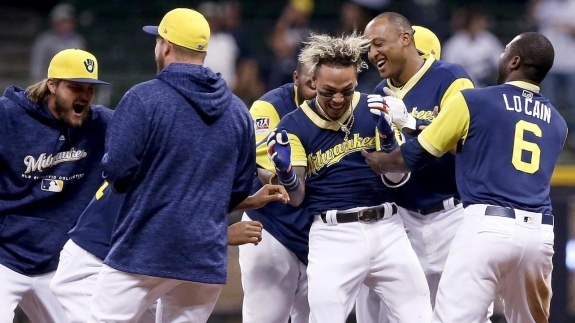 Last night at Miller Park, the Milwaukee Brewers (72-58, .554) plated four runs in the bottom of the first inning, but the Pittsburgh Pirates (63-66, .488) rallied back and forced extra innings. In the top of the 15th inning, the Pirates took a 6-4 lead, but the Brewers plated three more runs for a 7-6 win. Following action on Friday, the Cubs remain atop the National League Central with a three-game lead over the Cardinals. The Brewers sit 3 1/2 games off the pace. Both St. Louis and Milwaukee hold the two National League wild card spots. With both teams winning on Friday, the Brewers hold a one-game lead over the Rockies for the second wild card spot. This evening, the Brewers and Pirates will play the second game of a three-game series. Pittsburgh will start 26-year-old Jameson Taillon (9-9, 3.58 ERA). Taillon has faced Milwaukee three times during the 2018 regular season. During those three starts (May 5, June 19 and July 12), he compiled a 1-1 record with a no-decision, but Pittsburgh lost two of the three. He best start against Milwaukee was the most recent, on July 12 in Pittsburgh, when he pitched six innings and allowed one earned run. Jhoulys Chacin (13-4, 3.58 ERA) has been Milwaukee's ace during 2018. The 30-year-old righty has provided consistent pitching for a rotation devastated by injuries. As late as Friday, the Milwaukee attempted to acquire an arm to provide a lift for the final month of the regular season. Unfortunate for Milwaukee, the team failed to complete a deal the Reds for Matt Harvey. Chacin earned wins during his last three starts against the San Diego Padres (50-81, .382), Cubs and Cardinals. He pitched six, seven and six innings respectively. During his August 8 start against the Padres, he allowed three earned runs. He has not allowed a single earned run in his last two starts. Fun Fact: I saw the same two teams play at Miller Park on May 5, 2018, with the same starting pitchers facing each other.